safeTALK is a half-day alertness workshop that prepares anyone in the workplace, regardless of prior experience or training, to become a suicide-alert helper. Most people with thoughts of suicide don’t truly want to die, but are struggling with the pain in their lives. Through their words and actions, they invite help to stay alive. safeTALK-trained helpers can recognise these invitations and take action by connecting them with life-saving intervention resources, such as caregivers trained in ASIST (Applied Suicide Intervention Skills Training). The safeTALK course has been developed over the past 30 years by LivingWorks and is delivered by a LivingWorks registered trainer. safeTALK is an excellent tool for anyone in the workplace who wants to become alert to the dangers of suicide, including staff who support colleagues as part of their role, or who link with customers/clients on the telephone or face to face. Apply the TALK steps (Tell, Ask, Listen, and KeepSafe) to connect a person thinking about suicide to a suicide intervention resource. Connecting people at risk of suicide with further appropriate help. safeTALK is a powerful experience. You can expect to feel challenged, empowered, and hopeful. The trainer will demonstrate the importance of suicide alertness and help you identify ways people invite help when they’re at risk. safeTALK’s steps provide a simple yet effective method to engage with people at risk and connect them with resources that can carry out a full-scale intervention. At the end of the workshop, you’ll have a chance to practise these skills firsthand. All in all, you can expect to leave safeTALK with practical knowledge of how to identify someone at risk and link them to life-saving resources. Each participant will receive a Certificate, wallet sized reference card, “Talk to me” stickers and resource pack, plus information about sources of support. How does SafeTALK integrate with Asist? (ASIST – Applied Suicide Intervention Skills Training 2 day course). 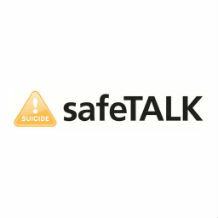 What safeTALK does do is help participants identify people who are at risk; confidently ask them about the topic of suicide, and connect them with resources that can help them stay safe – this might be a professional caregiver or someone trained in ASIST. By providing a connection to intervention resources, safeTALK offers an important avenue to assistance when people need it most. Many organizations use both safeTALK and ASIST to create a larger, more effective network of suicide intervention resources. The result is that those at risk of suicide are more likely to have their invitations for help recognized – and more likely to get the help they need in staying safe.